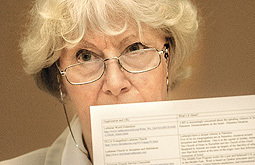 Lynette Stilley holds a list of Web addresses concerning the peace movements in the Middle East. Stilley and her husband, Jerry, are leaving in September for the Jerusalem area as part of a peacekeeping mission. HICKORY - With violence toward Westerners escalating across the Middle East, the United States government has issued statements discouraging its citizens from traveling there. The warnings don’t phase Jerry and Lynette Stilley. "We’re going anyway," said Lynette, a 69-year-old retired teacher. She and husband Jerry, 70, are going to the Jerusalem area in September to serve as international observers for a peacekeeping mission. A person’s politics determine what he or she calls the Stilley’s destination. They call the area occupied Palestine. The Stilleys are passionately concerned with the plight of the Palestinian people. The couple met Thursday with Kevin Monroe, a representative from Sen. John Edwards’ office. Since peace activists in the region sometimes run into trouble with the Israeli government, Lynette said, it’s wise to inform one’s own government in the hopes of garnering support. Monroe listened and took notes Thursday as the Stilleys and a handful of like-minded Unifour residents - some of whom have traveled to the Middle East as missionaries or activists - explained their convictions about the troubled region. "Most people have no idea what is going on over there," said Lisa Caldwell, a Waynesville woman and friend of the Stilleys who recently returned from a Christian mission trip in the region. Caldwell said human rights violations against the Palestinians are glaring. She told of curfews and checkpoints that restrict the people’s right to travel, residents terrorized in their homes by soldiers searching from militants, children killed or maimed during confrontations, and the 24-foot high concrete wall Israel is constructing around Palestinian areas. "It’s horrific," Caldwell said. "So much terrorism in the world comes out of this. It’s a situation that needs taking care of with justice." Jerry and Lynette Stilley believe they can help. As international observers, their charge is to simply be there, to watch, listen, and report their experiences to as many people as possible. "I feel strongly about the call to answer," Lynette said. "They’ve said, ’We need people to be here. We need people to see, we need people to tell.’ There’s something we can do, and we’re pleased about that." The Stilleys have always felt strongly about helping others, Lynette said. And this won’t be the first time they’ve gone abroad to answer a call: The two worked in Belize with the Peace Corps in the early 1990s, and later taught English in Oaxca, Mexico. Lynette has been to Israel/Palestine about 10 times, she said, but never as a peace activist. She was inspired by the story of Rachel Corrie, the 23-year old Charlotte woman who was killed in the West Bank last year while working as an international observer. Corrie, an unarmed activist, was crushed by a bulldozer manned by two Israeli soldiers. She was trying to prevent the demolition of a Palestinian pharmacist’s home. "That did it for me," Lynette said. "I suffered and mourned the loss of that young woman." The two plan to leave Sept. 11 and stay for at least a month, working with other activists from around the world. Lynette, who has some physical difficulties due to multiple sclerosis, will be working out of the peace-keeping mission’s office. She said her disease is currently in remission. "If I’ve got one more chance, I’m going for it," she said. Jerry, a retired building inspector, will be more or less on the front lines. He said he will serve as an observer at hot spots such as Israeli checkpoints, the construction sites for the Israeli wall and places where bulldozers are moving in on homes. Despite the danger, Jerry said he was looking forward to getting an unmediated, firsthand view of the region. "Sure, we have some trepidations," Jerry said. "But you can get killed right here in Hickory. We feel the fear, but we’re doing it anyway." Lynette said a strong sense of justice was the couple’s central motivation. "I think that everyone to live life must have a perspective, a point from which to view the world," she said. "The golden rule has always been quite a measuring stick."